"Where Our Customers Send Their Friends"
Are you looking for friendly, personal service? Are you looking for a shop you can trust? Do you need help getting your vehicle back on the road quickly? Well, Gorby's Automotive and Transmission Service provides all of this. Gorby's Automotive and Transmission Service provides expert service and repairs for car and truck owners near the University of Dayton campus. Students and Staff of UD choose Gorby's Automotive and Transmission Service for our fast and friendly service as well as our affordable service rates and the professional quality of our work. Gorby's is conveniently located just down the street from the University of Dayton and UD ghetto. We are AAA Approved auto repair facility and ASE Certified. Contact us today for a appointment. 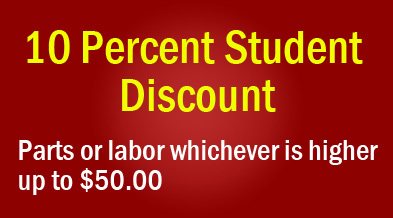 Discounts for University of Dayton Students.